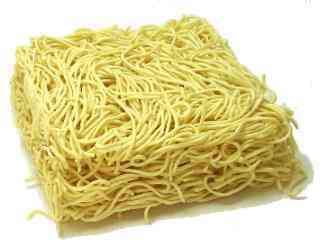 Asian noodles Notes: Until recently, the U.S. government required a noodle to contain flour, water, and eggs to be rightly called a noodle. Since most Asian noodles aren't made with eggs, this left them without much of an identity. The FDA permitted names like "alimentary paste" and "imitation noodles," but Asian noodle producers--from the birthplace of the noodle no less--could not use the n-word. The government finally relented, and we can now use the name "Asian noodles." Chinese noodles = mein = min = mian Notes: The Chinese like their noodles long and slippery, the better to slurp down noisily. 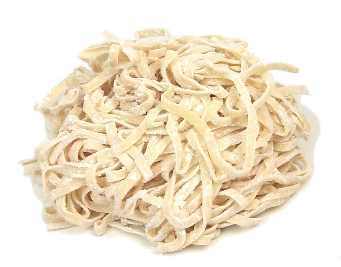 They're especially fond of wheat noodles, which they use in soups, and wheat and egg noodles, which they use in stir-fries and chow mein, their famous fried noodle dish. 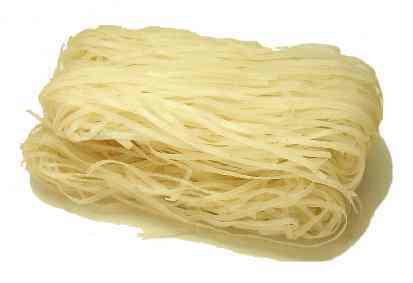 Rice noodles and bean threads are also popular. Filipino noodles = pancit Notes: In their soups and stir-fries, Filipinos like to use pancit canton, yellow noodles made of wheat flour and coconut oil. 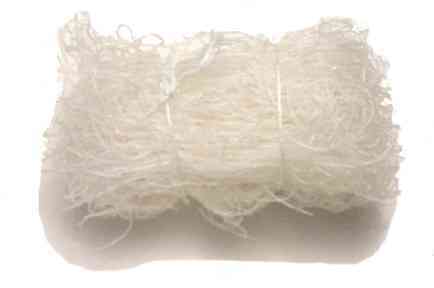 Slippery cornstarch noodles (called pancit luglug), are used in soups and salads. 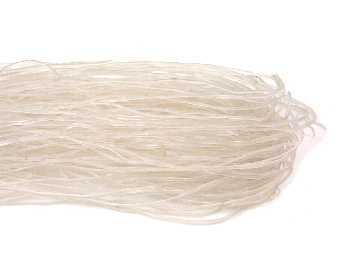 Indonesian noodles = mi = mie Notes: Indonesians like to use bean threads (which they call su un), and rice vermicelli. They also use egg and wheat-flour noodles to make bami goreng, a fried noodle dish. Korean noodles = myun Notes: Korean sweet potato vermicelli (which they call tang myon) is very slender, and has a somewhat rubbery texture. Korean buckwheat noodles are also chewy, and usually served cold. 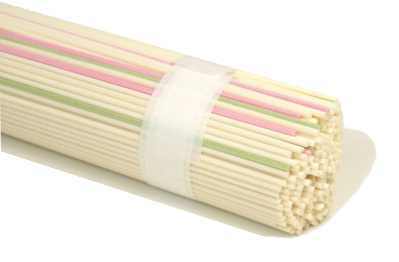 Koreans are also fond of rice sticks and Chinese egg noodles. Malaysian noodles = mee Notes: Malaysians are fond of yellow Hokkien noodles and white laksa noodles, which they use in soups. Malaysians also use rice vermicelli (which they call beenhoon), medium rice sticks (kway teow), beans threads (tanghoon), and Chinese wheat noodles. 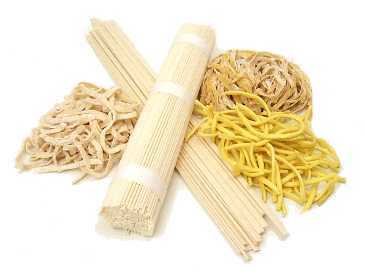 Thai noodles Notes: Thai cooks use rice noodles of various sizes, as well as bean threads and Chinese egg noodles. 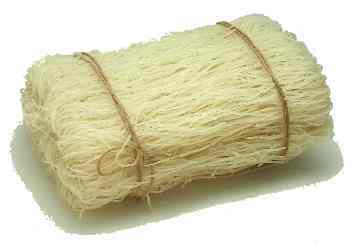 Vietnamese noodles = mi Notes: The Vietnamese are fond of rice noodles, which range in size from the slender banh hoi (rice vermicelli) to bun (thin rice sticks) to banh pho (medium rice sticks). 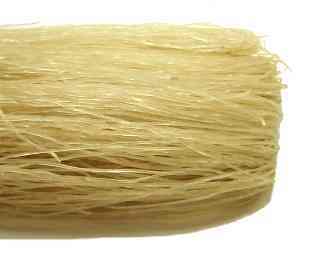 They also use slender bean threads made from mung bean starch (which they call bun tao or sometimes mien), and Chinese egg noodles.